USS Harry S. Truman (CVN 75) is the ninth nuclear-powered aircraft carrier and the eighth in the Nimitz class. The keel was laid by Newport News Shipbuilding Nov. 29, 1993 and the ship, named after the 33rd President of the United States, was christened Sept. 7, 1996. The ship was launched Sept. 13, 1996 and delivered to the United States Navy June 30, 1998. Harry S. Truman was commissioned July 25, 1998. In August 1998, Harry S. Truman was put to sea for the first time as a U. S. Navy carrier to conduct flight deck certifications, an evolution designed to test the ship’s ability to successfully launch and recover aircraft. After an extensive work-up cycle that tested the ship and challenged the crew, Harry S. Truman embarked on its maiden deployment November 28, 2000. On Feb. 16, 2001, the Truman team was called into action in support of Operation Southern Watch. In response to surface-to-air missile fire against coalition forces enforcing United Nations Security Counsel Resolutions, aircraft from Carrier Air Wing Three (CVW-3) took part in a sanctioned response and struck Iraqi integrated air defense system sites. The air wing flew 869 combat sorties, totaling more than 2, 700 flight hours. After nearly 180 days and traveling more than 44, 000 nautical miles, Harry S. Truman completed its first deployment May 23, 2001. Harry S. Truman entered the Norfolk Naval Shipyard for its first Planned Incremental Availability September 5, 2001. Six months later, Harry S. Truman began training for its second deployment in support of Operation Enduring Freedom, which began Dec. 5, 2002. Tensions with Iraq were high as the Truman team prepared itself for the possibility of conflict. In early February 2003, Harry S. Truman took up station in the Eastern Mediterranean and waited for word to launch strikes against Saddam Hussein’s regime in Iraq. When the order came in the late-night hours of March 19, Operation Iraqi Freedom was in full swing. Harry S. Truman successfully launched 1, 280 sorties, dropped more than 700 tons of ordnance and helped liberate the people of Iraq. Harry S. Truman was relieved of its Operation Iraqi Freedom support duties on April 18, 2003. In August 2003, Harry S. Truman entered Norfolk Naval Shipyard for its second Planned Incremental Availability. The ship pulled out of the shipyard on February 13, 2004, four days early and under budget. After leaving the shipyard, the Harry S. Truman team focused on preparing to re-enter the Global War on Terrorism. Under the Navy’s new Fleet Response Plan, Harry S. Truman surged to the Mediterranean as one of seven carriers participating in Summer Pulse ‘04, while simultaneously completing the required training exercises that will ensure the ship and air wing team are ready to act when called upon. After another successful yard period and an intense work-up cycle, Truman departed Norfolk on a seven-month combat deployment in November 2007. Throughout the deployment, Truman supported Maritime Security Operations in the Mediterranean Sea and Persian Gulf and safely launched and recovered over 15, 300 fixed and rotary wing aircraft. Simultaneously, aircraft from CVW-3 flew more than 26, 500 hours during 9, 500 sorties. Of these, 2, 459 were combat sorties directly supporting Coalition forces serving in Operation Iraqi Freedom. The air wing flew just under 14, 000 combat hours and expended 77, 500 pounds of ordnance. Truman completed her third Planned Incremental Availability in February of 2009 and has undergone numerous underways since that time to include an ammunition on load in March, Tailored Ship’s Training Availability (TSTA) and Final Evaluation Problem (FEP) in April and May, Board of Inspection and Survey (INSURV) and Combined Training Unit Exercise (COMTUEX) in June, squadron Carrier Qualifications in July and August, Joint Task Force Exercise (JTFEX) in September and planned Carrier Qualifications are scheduled up to her next deployment in 2010. 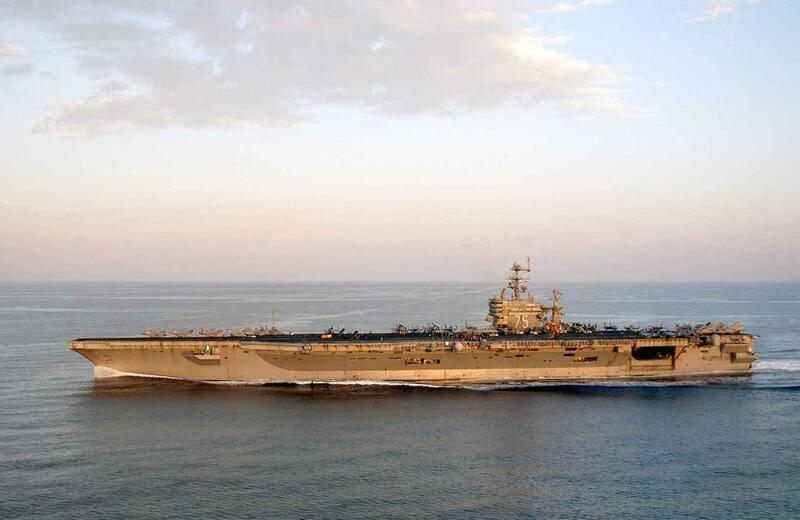 USS Harry S. Truman (CVN 75) has won five Battle "E" awards: 2003, 2004, 2005, 2008, 2009.